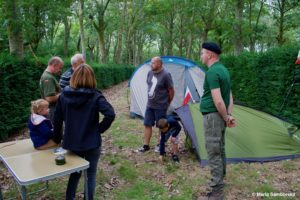 On Saturday, September 8th 2018 afternoon, the first campers started to erect their tents in the beautiful park of Canada-Poland War Museum in Adegem. They were General Maczek’s fans from Poland, Belgium, Netherlands and France and they came for the First World General Maczek Fan Jamboree. They were welcomed by the organizers: Jerzy Samborski – author and leader of the „Liberation Route of General Maczek’s 1. Polish Division” programme, Maria Samborska – Communication and PR Manager, Barbara Keil Skrobiszewska – vice-president of President Kaczorowski Foundation and the hosts – the owners of the Museum, Gilbert and Alexandra van Landschoot. According to the time schedule, participants visited impressive exhibition in Canada-Poland War Museum, having the great Gilbert van Landschoot as a guide. What they enjoyed most, were the unbelievably realistic mannequins of 1st Polish Armored Division soldiers, made with every little detail. 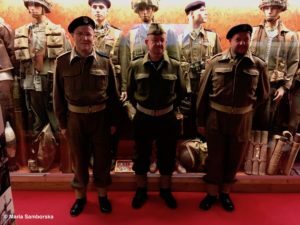 Great number of original exhibits, mostly being gifts from the soldiers themselves or from their families, makes the Museum in Adegem the most notable one among institutions which expose the history of the 1st Polish Armored Division. 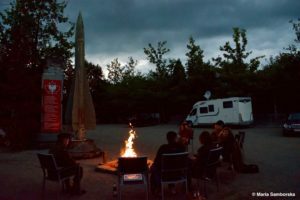 After dinner in the Museum’s restaurant or at the camp kitchen, participants gathered around the bonfire, situated close to the rocket used to destroy German tanks. The presentation of photos, albums, original journals and notes written by the 1st Polish Armoured Division soldiers, was continued. 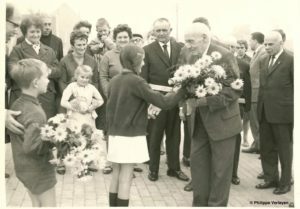 Philippe Verleyen from Aalter shown the photograph from 1969, from the ceremony of unveiling the monument dedicated to General Maczek’s Division, on which he personally, the little boy, had been handing over the bunch of flowers to General Maczek. Eduard Krykowski, the son of Maczek’s soldier, presented his father’s photo album from 1940-1945 and more other original documents and military decorations.